Quite rightly the shockwaves from recent abuse scandals are reverberating through classical music. These shameful scandals, which have done untold damage to classical music's image, were ticking time bombs that too many people in the know chose to ignore. What is worrying is there are other time bombs that are being glossed over, but which may soon explode causing yet more damage. Dangerous thinking has been abroad in classical music for years, namely that its role as a priceless form of high art licenses unacceptable behaviour. It is this dangerous thinking that resulted in the misdemeanours of several celebrity conductors being glossed over for decades, and it is the same thinking that allows other less emotionally traumatising but still highly questionable behaviour to be glossed over. One vulnerability that is all too frequently ignored is the lamentable human rights records of regimes that classical music is consorting with. The United Arab Emirates is one of the new 'go to' destinations for touring orchestras. To dismiss classical music's active participation in the ethical whitewashing of the United Arab Emirates as victimless and abuse-free is factually incorrect. A Hindustani Times article reports that at least 450 Indian migrant workers have died on Dubai construction sites alone since 2014 as a result of unacceptably dangerous working conditions, and that situation is mirrored in many other Gulf States. Dubai provides a striking example of classical music's hypocrisy. To much fanfare it was recently announced that the BBC Proms and other leading classical festivals have pledged a laudable 50/50 gender split in their lineups by 2022. But just one year earlier the BBC had launched with equally loud fanfare the inaugural BBC Proms Dubai . Let's ignore, if indeed we can, the maltreatment of migrant workers in Dubai, not to mention the persecution of homosexuals. 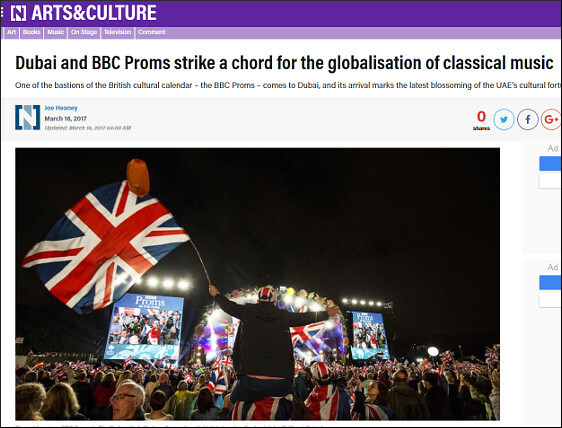 Instead let's join up the dots and link the BBC' posturing on gender equality with women's rights in the home of the BBC Proms Dubai. The UAE penal code retains elements of Sharia law, notably in the Sharia-based Personal Status Law covering marriage, divorce and succession. Human Rights Watch reports that "Federal law No. 28 [(Personal Status Law] of 2005 regulates matters of personal status in the UAE, and some of its provisions discriminate against women. For instance, the law provides that, for a woman to marry, her male guardian must conclude her marriage contract; men have the right to unilaterally divorce their wives, whereas a woman who wishes to divorce her husband must apply for a court order; a woman can lose her right to maintenance if, for example, she refuses to have sexual relations with her husband without a lawful excuse; and women are required to “obey” their husbands. A woman may be considered disobedient, with few exceptions, if she decides to work without her husband’s consent. In 2010, the Federal Supreme Court issued a ruling—citing the penal code—that sanctions husbands’ beating and inflicting other forms of punishment or coercion on their wives, provided they do not leave physical marks". A refusal to acknowledge the very real problem of climate change is another of classical music's vulnerabilities. The Far East, and China in particular, is another new 'go to' destination for orchestras. The aviation industry depends entirely on fossil fuel and consumes a staggering 5 million barrels of oil every day; that is 2.5% of total carbon emissions. A plane flying from Europe to the Far East and back generates 4.5 tonnes of carbon, which compares with average per capita emissions globally of around 1 tonne. A 2010 study by the University of Surrey reported that the UK music industry's activities generate around 540,000 tonnes of greenhouse-gas emissions. Audience travel accounts for 43% of those greenhouse-gases, live venue music events accounted for 23%, and music recording and publishing 26%. Of course orchestras need to tour; but to my knowledge there have been no attempts within classical music to recognise this environmental impact by, for example, introducing carbon offsets. Vulnerabilities converge in the press release below. 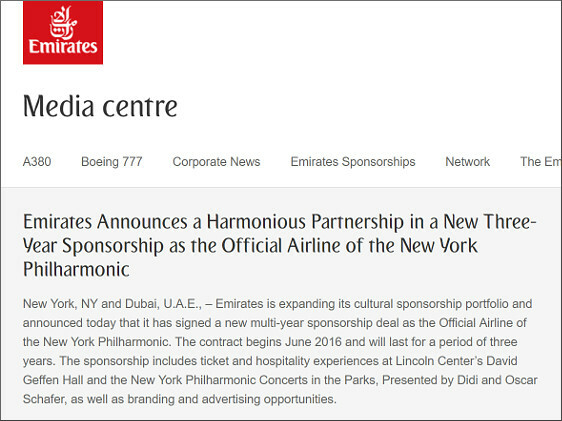 The New York Philharmonic's official airline and sponsor Emirates is part of the Emirates Group domiciled in Dubai in the United Arab Emirates. Its chairman is Ahmed bin Saeed Al Maktoum who is chairman of the Dubai Supreme Fiscal Committee, second vice chairman of the Dubai Executive Council and closely related to the Dubai royal family. Dubai is the largest city in the United Arab Emirates. Human Rights Watch states that "The United Arab Emirates (UAE) arbitrarily detains and in some cases forcibly disappears individuals who criticize the authorities. The UAE plays a leading role in the Saudi-led coalition which has carried out scores of unlawful attacks in Yemen, some likely war crimes. The UAE was implicated in detainee abuse at home and abroad... The UAE has denied activists and international human rights organizations’ access". While pursuing this thread it is worth pointing out that in 2011 the chairman of the New York Philharmonic's official airline Ahmed bin Saeed Al Maktoum was involved in a high profile paternity court case. The Telegraph reports he denied being married in a secret ceremony at his Knightsbridge flat and having a son with his partner/wife, claiming she was nothing more than a "courtesan" and an "irregular" sexual partner. The Emirati tycoon, whose net worth is £19 billion, reportedly only accepted the child was his after taking a paternity test using the alias 'Robert Smith'. The marginalisation of women in Dubai and elsewhere in the UAE is undoubtedly far worse that the lamentable marginalisation of women in Western classical music. And returning to that gender equality pledge, how many orchestras welcomed with open arms at the BBC Proms between now and 2020 will also have strutted their stuff in the UAE where wife beating is sanctioned? How many others will join Simon Rattle and the Berlin Philharmonic, Gustavo Dudamel, Riccardo Muti, Iván Fischer and the Budapest Festival Orchestra, and Jordi Savall in accepting thirty pieces of silver from Abu Dhabi and other tarnished regimes? How many more feel-good press releases are we expected to swallow without questioning what celebrity musicians do 4500 miles from the Albert Hall? In conclusion I will say goodbye to any remaining slim chance of 'likes' and re-tweets and raise concerns about the misuse of the gender equality ticket for click bait-friendly ethical whitewashing, as in the example of the BBC Proms cited above. This blog was one of the very first to raise the problem of gender inequality, ironically in an article about the lack of women composers in the 2006 Proms season. Great work has been done to eliminate gender inequality and much work still needs to be done; but classical music must beware of single issue fanaticism. Gender inequality must be eradicated, but so must a number of other ethical malpractices including ethnic discrimination, and cosying up to ethically-compromised regimes and ethically-compromised corporations. Tackling gender inequality is just one component in building a truly diverse and ethical classical music; it is not the only component. What irks me is that if Radio 3 really meant what they say about women composers, including commissioning 50% of new works, they should do a concert performance of The Wreckers, or another BIG piece, rather than just token bits and pieces of work.